Abedi, Maysam, Mosazadeh, Kiomars, Dehghani, Hamid, MadanchiZare, Ahmad. (1394). Geological noise removal in geophysical magnetic survey to detect unexploded ordnance based on image filtering. مجله ژئوفیزیک ایران, 9(5), 11-23. Maysam Abedi; Kiomars Mosazadeh; Hamid Dehghani; Ahmad MadanchiZare. "Geological noise removal in geophysical magnetic survey to detect unexploded ordnance based on image filtering". 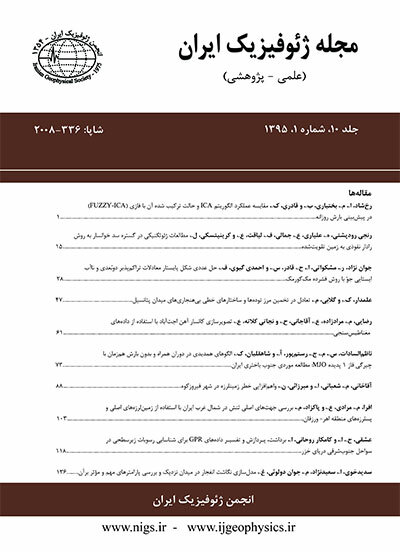 مجله ژئوفیزیک ایران, 9, 5, 1394, 11-23. Abedi, Maysam, Mosazadeh, Kiomars, Dehghani, Hamid, MadanchiZare, Ahmad. (1394). 'Geological noise removal in geophysical magnetic survey to detect unexploded ordnance based on image filtering', مجله ژئوفیزیک ایران, 9(5), pp. 11-23. Abedi, Maysam, Mosazadeh, Kiomars, Dehghani, Hamid, MadanchiZare, Ahmad. Geological noise removal in geophysical magnetic survey to detect unexploded ordnance based on image filtering. مجله ژئوفیزیک ایران, 1394; 9(5): 11-23. This paper describes the application of three straightforward image-based filtering methods to remove the geological noise effect which masks unexploded ordnances (UXOs) magnetic signals in geophysical surveys. Three image filters comprising of mean, median and Wiener are used to enhance the location of probable UXOs when they are embedded in a dominant background geological noise. The study area consists of three buried UXOs while a geological dyke structure covers the magnetic anomaly of the desired objects. To provide a better representation of the actual locations of UXOs in the observed magnetic anomaly over this area, all image-based filters could appropriately separate the geological dyke effect from the UXOs. These image filters can be good candidates to remove the geological noise effect in UXO detection when encountering a mixed response of multi-source magnetic anomaly in contaminated territories with UXOs. An analytic signal map of the separated magnetic anomaly of UXOs was provided to enhance locations of the UXOs in the studied field. Also, a combination of the analytic signal and the Euler deconvolution methods were used to estimate the depth of three buried UXO targets in the study area indicating a high sensitivity of the estimated parameter to the noise level. Abedi, M., Mosazadeh, K., Dehghani, H., and MadanchiZare, A., 2014, Enhancing magnetic signals in unexploded ordnances (UXO) detection based on edge-preserved stable downward continuation method: Journal of Mining & Environment, 5, 13-24. Beard, L.P., Doll, W.E., Holladay, J.S., Gamey, T.J., Lee, J.L.C., and Bell, D.T., 2004, Field tests of an experimental helicopter time-domain electromagnetic system for unexploded ordnance detection: Geophysics, 69, 664-673. Bell, T., Barrow, B., Miller, J., and Keiswetter, D., 2001, Time and Frequency Domain Electromagnetic Induction Signatures of Unexploded Ordnance: Subsurface Sensing Technology and Applications, 2, 153-175. Benavides, A., and Everett, M.E., 2007, Non-linear inversion of controlled source multi-receiver electromagnetic induction data for unexploded ordnance using a continuation method: J. Appl. Geophys., 61, 243-253. Billings, S.D., and Youmans, C., 2007, Experiences with unexploded ordnance discrimination using magnetometry at a live-site in Montana: J. Appl. Geophys., 61, 194-205. Billings, S.D., and Wright, D., 2010, Interpretation of high-resolution low-altitude helicopter magnetometer surveys over sites contaminated with unexploded ordnance: J. Appl. Geophys., 72, 225-231. Blakely, R.J., 1995, Potential theory in gravity and magnetic applications: Cambridge University Press. Bruschini, C., Gros, B., Guerne, F., Piéce, P.Y., and Carmona, O., 1998, Ground penetrating radar and imaging metal detector for antipersonnel mine detection: J. Appl. Geophys., 40, 59-71. Butler, D.K., 2000, Assessment of Microgravity for UXO Detection and Discrimination: U.S. Army Engineer Research and Development Center, 1-37. Butler, D.K., 2001, Potential fields methods for location of unexploded ordnance: The Leading Edge, 20, 890 – 895. Butler, D.K., Wolfe, P.J., and Hansen, R.O., 2001, Analytical modeling of magnetic and gravity signatures of unexploded ordnance: Journal of Environmental and Engineering Geophysics, 6, 33 – 46. Butler, D.K., 2003, Implications of magnetic backgrounds for unexploded ordnance detection: J. Appl. Geophys., 54, 111-125. Butler, D.K., Simms, J.E., Furey, J.S., and Bennett, H.H., 2012, Review of Magnetic Modeling for UXO and Applications to Small Items and Close Distances: Journal of Environmental and Engineering Geophysics, 17, 53-73. Davis, K., Li, Y., and Nabighian, M.N., 2010, Automatic detection of UXO magnetic anomalies using extended Euler deconvolution: Geophysics, 75, G13-G20. Davis, K., Li, Y., and Nabighian, M.N., 2011, Effects of low-pass filtering on the calculated structure index from magnetic data: Geophysics, 76, L23-L28. Debeglia, N., and Corpel, J., 1997, Automatic 3-D interpretation of potential field data using analytic signal derivatives: Geophysics, 62, 87-96. Hood, P., 1965, Gradient measurements in aeromagnetic surveying: Geophysics, 30, 891-902. Huang, H., and Won, I.J., 2000, Conductivity and Susceptibility Mapping Using Broadband Electromagnetic Sensors: Journal of Environmental and Engineering Geophysics, 5, 31-41. Huang, H., and Won, I.J., 2003a, Detecting metal objects in magnetic environments using a broadband electromagnetic method: Geophysics, 68, 1877-1887. Huang, H., and Won, I.J., 2003b, Automatic anomaly picking from broadband electromagnetic data in an unexploded ordnance (UXO) survey: Geophysics, 68, 1870-1876. Huang, H., and Won, I.J., 2003c, Characterization of UXO-Like Targets Using Broadband Electromagnetic Induction Sensors: IEEE Trans. Geosci. Remote Sensing, 41, 652-663. Huang, H., and Won, I.J., 2004, Electromagnetic detection of buried metallic objects using quad-quad conductivity: Geophysics, 69, 1387-1393. Huang, H., SanFilipo, B., Oren, A., and Won, I.J., 2007, Coaxial coil towed EMI sensor array for UXO detection and characterization: J. Appl. Geophys., 61, 217-226. Khireddine, A., Benmahammed, K., and Puech, W., 2007, Digital image restoration by Wiener filter in 2D case: Advances in Engineering Software, 38, 513-516. Koppenjan, S.K., Allen, C.M., Gardner, D., Wong, H.R., Lee, H., and Lockwood, S.J., 2000, Multi-frequency synthetic-aperture imaging with a lightweight ground penetrating radar system: J. Appl. Geophys., 43, 251-258. Krahenbuhl, R., Li, Y., Nabighian, M., Davis, K., and Billings, S., 2011, Advanced UXO Detection and Discrimination Using Magnetic Data Based on Extended Euler Deconvolution and Shape Identification through Multipole Moments: SERDP Project MR-1638, p. 117. Li, Y., Krahenbuhl, R., Meglich, T., Oldenburg, D., Pasion, L., Billings, S., van Dam, R., and Harrison, B., 2010, Improving UXO Detection and Discrimination in Magnetic Environments: SERDP Project MM-1414, p. 278. Li, Y., Devriese, S.G.R., Krahenbuhl, R., and Davis, K., 2013, Enhancement of Magnetic Data by Stable Downward Continuation for UXO Application: IEEE Trans. Geosci. Remote Sensing, 51, 3605-3614. Lim, Jae S., 1990, Two-Dimensional Signal and Image Processing: Englewood Cliffs, NJ, Prentice Hall, p. 548. Nabighian, M.N., 1972, The analytic signal of two-dimensional magnetic bodies with polygonal cross-section: its properties and use for automated anomaly interpretation: Geophysics, 37, 507–517. Nabighian, M.N., 1974, Additional comments on the analytic signal of two dimensional magnetic bodies with polygonal cross-section: Geophysics, 39, 85–92. Nabighian, M.N., 1984, Toward a three-dimensional automatic interpretation of potential field data via generalized Hilbert transforms: Fundamental relations: Geophysics, 49, 780–786. Pasion, L.R., 2007, Inversion of time domain electromagnetic data for the detection of unexploded ordnance: PhD Thesis, The University of British Columbia. Pasion, L.R., Billings, S.D., Oldenburg, D.W., and Walker, S.E., 2007, Application of a library based method to time domain electromagnetic data for the identification of unexploded ordnance: J. Appl. Geophys., 61, 279-291. Pawlowski, J., 1994, Ordnance Investigation Using an Electromagnetic Method, Lake Erie, Port Clinton, Ohio: report for USAE Waterways Experiment Station, by Geophysics Ltd., Mississauga, Ontario. Pawlowski, J., Lewis, R., Dobush, T., and Valleau, N., 1995, Proceeding of the Symposium on the Application of Geophysics to Engineering and Environmental Problems, Orlando, Florida, USA. Pederson, A., and Stalcup, B., 1997, Phase III advanced technology demonstrations at Jefferson proving ground: Proceedings of the UXO Forum’ 97: pp. 281 – 289. Press, W.H., 2008, Computational Statistics with Application to Bioinformatics: Unit 19, Wiener Filtering (and some Wavelets), The University of Texas at Austin. Ravat, D., 1996, Analysis of the Euler method and its applicability in environmental magnetic investigations: Journal of Environmental and Engineering Geophysics, 1, 229-238. Roest, W.R., Verhoef, J., and Pilkington, M., 1992, Magnetic interpretation using 3-D analytic signal: Geophysics, 57, 116-125. Salem, A., and Ravat, D., 2003, A combined analytic signal and Euler method (AN-EUL) for automatic interpretation of magnetic data: Geophysics, 68, 1952-1961. Sanchez, V., Li, Y., Nabighian, M.N., and Wright, D.L., 2008, Numerical Modeling of Higher Order Magnetic Moments in UXO Discrimination: IEEE Trans. Geosci. Remote Sensing, 46, 2568-2583. Thompson, D.T., 1982, “EULDPH” A new technique for making computer-assisted depth estimates from magnetic data: Geophysics, 47, 31-37. Wiener, N., 1949, Extrapolation, interpolation, and smoothing of stationary time series: Cambridge, MIT.